I’ve written before about running in RPGs, and in D&D in particular. The sprinting rule did make it into Dragon Heresy, so there is that. But as I was pondering a Pyramid article for GURPS on the way into work this morning, I realized that I was ignoring a potentially easy solution to my problem. Not everyone perceives this as a problem, but I’ve been noodling on it for a while. The issue is really that in GURPS, despite perceptions to the contrary, combatants are ridiculously mobile. Or, more specifically, the typical person can accelerate from a stop to some maximum speed, and then return to a standstill in one second, covering five yards in the process. They can also sprint five yards in one second, but then stay at that speed from there. Note that these two things don’t necessarily imply the same thing! If you look at the kinematics equations,and assume that your final velocity is 5yds/sec, and you covered 5yds in the process, then the average acceleration is V^2/2d, or 5*5 / (2 * 5yds) = 2.5 yds/s^2. If you assume constant acceleration that takes you five yards, then 5 = 1/2 A T^2, or since T = 1sec, A has to equal 10 yds/sec^2. The velocity at the end of that constant acceleration is not 5yds/sec, but 10. It’s actually the second one that’s more problematic, since your Move is largely considered to be your acceleration if you use the Enhanced Move advantage. If you have Move 5 and Enhanced Move 2, your maximum speed is 20, but it takes you four seconds to get to that speed. Ergo, your Move is your acceleration. But if you could really accelerate that fast, your speed on the turn after you accelerate is much higher than your basic movement allowance provides. Hicks: I wanna introduce you to a personal friend of mine. This is an M41A pulse rifle. Ten millimeter with over-and-under thirty millimeter pump action grenade launcher. Hicks: [Hicks hands the rifle to Ripley] Feel the weight. Ripley: Okay. What do I do? The M41 is iconic. It defines the look and feel of one of the best Aliens movies out there (in my opinion), and was, at least in this scene, treated more like a character than a piece of equipment. Ripley: Lieutenant, what do those pulse rifles fire? 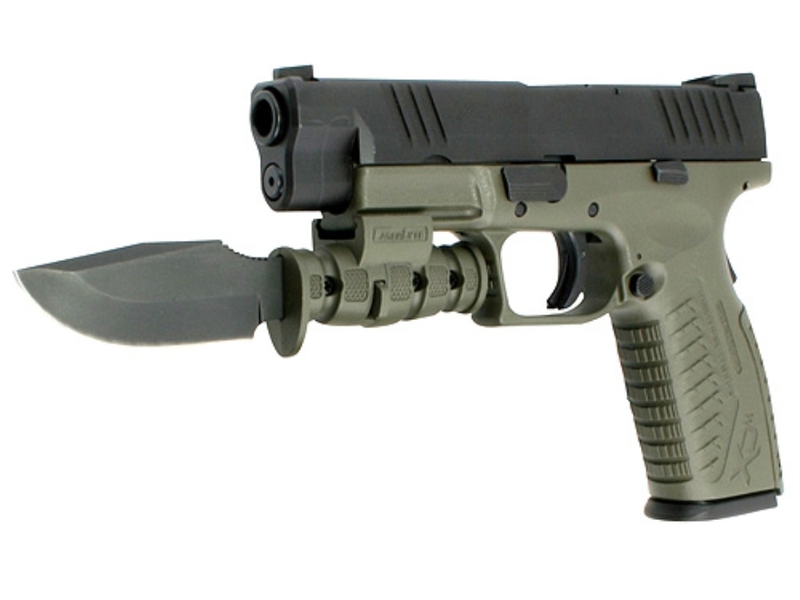 Gorman: 10 millimeter explosive tip caseless. Standard light-armor-piercing round, why? Other than the weapon itself, which was made in several non-firing mock-ups and one “hero” weapon that could actually fire blanks, that’s mostly the only information you have on the weapon itself. You do see that loading a fresh magazine gave something like 95 or 99 shots. This writeup is dedicated to +Kyrinn S. Eis who asked me very nicely to do it. Christmas came a bit late to Gaming Ballistic, but I found myself with a gift certificate to Cabelas. Since my wife and daughter both have bows, I decided I wanted one as well. I debated on compound bow vs. recurve, but I’ve always been a sucker for the simplicity of the recurve. It’s not a traditional longbow, which would have been awesome, but nonetheless it’s what I found myself with. 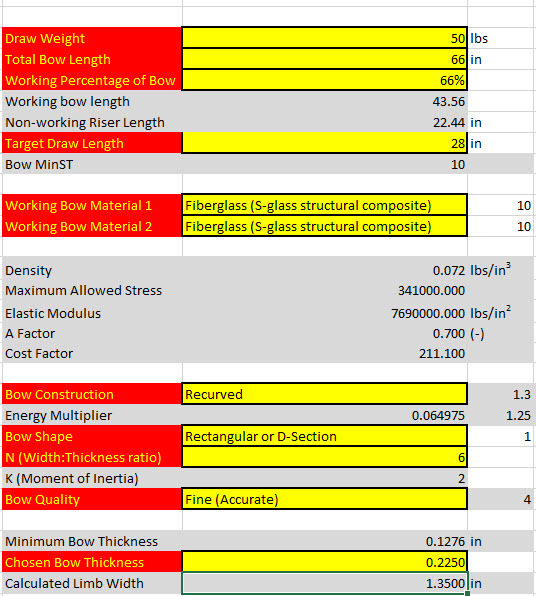 I asked for what they had in the 50# range (I wanted a strong-ish bow, and 50# is olympic standard), and stepped up to the firing line to trial the bow. First shot felt nice. 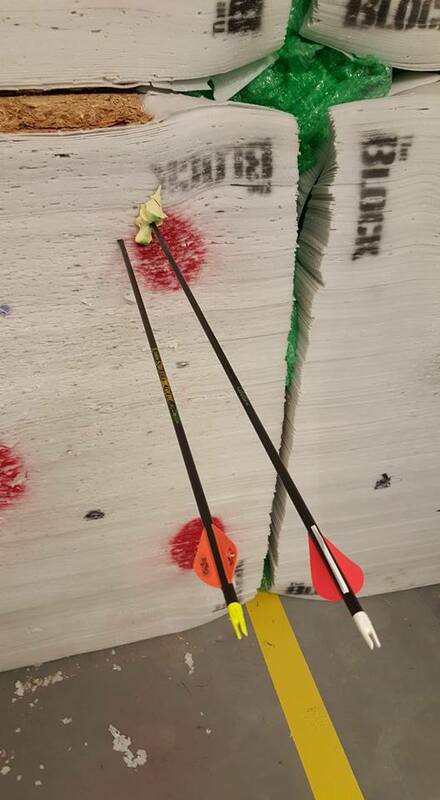 I was told to “aim at the fish,” which as a 1″ wide, 3″ long yellow foam thing stuck to the target. Second shot . . . hits the fish. I picked out a dozen feathered arrows that are probably a bit strong for the bow. The first sales guy I was trying to talk to was a bit of an asshat, so I wound up with the wrong arrows (55/70 instead of 45/60). 29″ shaft (we measured at full draw) and a dozen 100gr field tips that somehow never made it into my bag. Alas, but that’s only $10. The results of the shooting were pleasing enough that I just bought the thing. I’ll pick up some more points, and my family will try and find an archery club here in Minneapolis to start practicing more regularly. Shaeffer Archery nearby has an indoor range, so perhaps that’s the ticket. The bow itself can be worked out using The Deadly Spring. 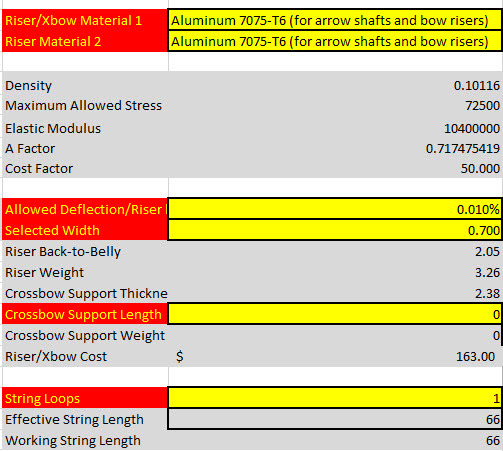 There are a lot of inputs, but cutting to the chase, the riser (non-working section of the bow) is 1/3 the total, while the limbs are 2/3 – this is obvious when it’s taken down, because each section is basically the same length. The inputs include fiddling with the limb thickness and a bunch of other stuff. Net/net, the model predicts a velocity of the shaft on the order of 200-210fps, Acc 2 (not great – maybe not enough), and a $300 price, which is probably a bit less then 2x higher than I paid for it. That’s OK, though – it’s designed with GURPS prices in mind. If I give it the “Cheap” modifier, the price is nearly exactly correct, but that would make it Acc 1, and I’m fairly sure that’s not accurate enough. I mean, it’s not an Acc 4 olympic recurve for actual Olympians, but perhaps it needs the “cheap is good, good is fine, and fine is very fine” type adjustment that knives get. Penetration is poor with field tips – as it should be. it’ll clock in at about 1.25 – 1.35 points of penetration including the armor multiplier of (0.5) for the field tips. If we slapped on a forged, barbed, heavy war point (about 500gr for the point, 250gr for the shaft) then damage would increase by a tiny bit, but not enough to eke out more than 1d-1 (1) imp or even 1d-1 (2) imp. More likely than the 2 is that it would increase penetration by about one point, which would make it about 1d imp. That heavy arrow would take the max range down to about 195 yds, and it will do full damage to the full range of the arrow’s fall. How good was that shot? I can’t wait to take it out for enough target practice to calculate a bow skill. But first, we look at the bonuses that I get for having all the time in the world and no orcs piling out of the clothing aisle trying to kill me. The light was good, the range was known, etc. That’s good for probably a +9 bonus (!). The size of the target is probably 1″ x 3″ about 3x the size of an eye, which makes it about -7 for size, and about -4 for range (11 yds is technically -5, but it’s . Accuracy is probably about +4 for the bow, 2 more for a long aim). That’s about +1 or +2 to skill net. 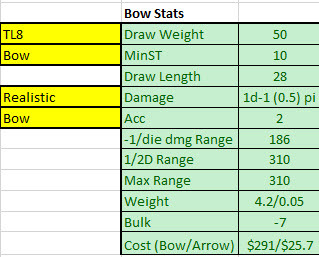 If I’ve got a single point in bow skill, Bow-9 would be adjusted to Bow-10 or Bow-11, which would actually give me about a 50-62% chance to pull off this trick. Also, All-Out Attack (Determined) helps. If I’m shooting from Default, it’s probably Bow-6 or Bow-7 (with Dabbler), which again would wind up Bow-9 or Bow-10, for about a 1 in 3 or 1 in 2 chance of putting an arrow on target – that seems not-wrong to me. I need a huge amount of bonuses to pull that off, but I have them, so I’m probably Bow-6 to Bow-9 as an estimate. Not spectacular, of course – but then, that is a testament to the quality of the rules. If I needed to self-identify as Bow-14 to pull this off, that’d be a problem. These make for interesting reads thus far. Check ’em out. An exploding damage die for GURPS? 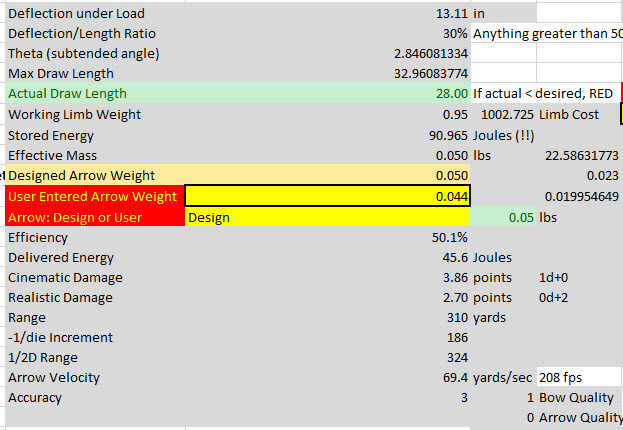 Some of the recent threads and comments about armor as dice have led me to think about alternate ways to get what I want out of Armor as Dice – less variable penetration so that if you armor rated for X (and GURPS defines X as 3.5 points per die for both penetration and resistance), and a bullet hits you with basically less energy than X, it won’t go through. Some of these distinctions don’t seem like much, or important. And to a certain extent, they’re very much not. If you have (say) a DR 8 bullet resistant vest, in theory it should be proof against a .45 ACP (2d pi+) but not a 9mm (2d+2 pi). Turning to AnyDice (and we’ll be doing that a lot this post) we see that the .45ACP will punch through DR 8 with 1 point or more of damage potential remaining just over 27% of the time in round numbers. The 9mm, which should always go through, will go through 58% of the time. This is very easy to rationalize. Poor angles, uncertain coverage, and other variables make armor less certain. The tendency to treat an armored vest as if it fully covers the entire torso (a legit simplification) makes the push to make every thing just work out neatly less mandatory. Still, players buy armor to buy protection, and some armors really are that good. The “solution” tends to be “if you want full protection in a gamist manner, buy DR6 per die of protection you want.” Thus, if you want to be fully protected vs. that 2d or 2d+2 bullet, buy DR 12 and DR 14 respectively, which will increase the weight of that armor piece by about 70%. OK, fine, but I am going to press forward and solve the non-problem anyway, because though there are many instances where you can rationalize the roll, there are others where you can’t. Armor as Dice has gotten plenty of love elsewhere. But there’s another method discussed in Armor Revisited (Pyr #3/34), which inverts the method: instead of listing Armor as dice and keeping the damage as dice, express the penetration as a fixed number, and go with variable injury. So instead of 2d, a .45ACP handgun would have a pentration rating of 7, a 9mm would be 9, a 5.56x45mm might have a 17, and a .50 BMG would be something like 40-46 depending on the barrel. So the effect is the same. Compare Penetration to DR, and if Pen is higher, it goes through. This also allows either using HP or “Mass-based” HP as a blow-through threshold as a number read right off a character sheet, precalculated before play starts for the mass-based number. So, for a straight-up, GURPS standard application, subtract DR from PEN, and then roll injury dice. Roll 1d for every 3.5 points of penetration that get through would be the most straight-forward conversion, though “divide by 3 or 4” would be easier in play. Remainders might just be adds. Actually, rolling 2d per 7 PEN, and converting so you always roll two dice might not be that bad. So a notional M4 carbine might do 16 penetration, and impacting DR 10 would have 6 remaining penetration points. Injury results, and you roll 1d+2 (average 5.5) or 2d-1 (average 6). A tank cannon that usually does 6dx20(2) would convert to 420(2), and faced with DR500 would be 420 PEN – 250 DR (thanks to the armor divisor), leaving 170 PEN left. Against machines, maybe you don’t roll, maybe you convert to 2dx24 or even 3dx17 if you want some randomness. But what if you want even more random injury – because injury is far, far more variable than penetration? I’ve recently been exploring the Savage Worlds system, which features exploding dice. Called an Ace in the game, if you roll the highest value on your die, you get to roll it again, and add it to the prior roll. Leading to the unusual circumstance that you can’t roll a 6 on an exploding d6. But nevermind that. An exploding die is basically a geometric progression. It’s the average value of the die (3.5 for d6), multiplied by 1 + the probability that you get to roll again (1/6) + the probability you get to roll a third time, fourth time, etc. and in this case, a = 3.5 and r is 1/6. If we were rolling a d8, a would be 4.5 and r is 1/8. And one of the very interesting things here is that the first four values are of great interest to GURPS players, since they represent typical wound multipliers for crushing (Never), just under +1 per die (6), pi+ or cut (5-6), and imp or pi++ (4-6). So you could replace damage multipliers with exploding dice, and each die explodes separately. So your .45 ACP that does 2d pi+ could legitimately roll a 2. If one really got enamored of exploding dice due to the variability, I’d simply apply a -1 per die to all damage, and let all d6 explode on a 6. That doesn’t quite balance out. 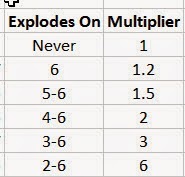 It’s a 1.2 multiplier for the explosion, but -1 per die is x0.71, for a net of a 15% loss in damage. In any case, you’ll wind up converting any penetration that gets through DR to dice. Exploding dice. So the injury can be pretty variable.I’d convert at 4 points per die. Though injury might be variable, it would be easy to make blowthrough not be that way. So if you were shooting with a firearm with PEN 25 at a person with DR 8 and a blowthrough threshold of 11 (maybe he weighs about 180 lbs), you’d have 17 penetrating damage, or about 4d+1 injury. But what happens downstream? The bullet loses a flat 11 going through the guy, and stops in the DR 8 armor in his back. Let’s say it was an AP bullet at 25 PEN. So DR drops to 4, and so does blowthrough, dropping to 6. So the bullet punches through the DR on both sides and the guy, with 11 remaining to threaten others. You then make a choice – do you apply the full amount (PEN 25 less DR 4) which is PEN 21, or 5d+1 to your foe, or limit it to blowthrough, either 11 or 6. This might call for revisiting the pi ratings of some rifle rounds – the 7.62x51mm bullet that we’re more or less simulating here can have a pretty impressive temporary cavity, which can cause some odd effects. But if it doesn’t hit anything vital, the AP bullet might just zip on through, with something like a 2d+3 wound. 8.4 damage on the average, about a pistol-sized wound. Bullets that (say) tumble and fragment might expend a lot of energy blowing through, etc. But that’s a detail best left to other rules. We’re borrowing a mechanic from another game here (Savage Worlds, but other games have had exploding dice before SW), so one has to be careful. Still, it’s a better fit – isolated to effect rolls, and applied to something that’s highly variable, an injury roll – than the D&D Advantaged mechanic is to the GURPS space. The impact on actual damage rolled isn’t that high – a 20% boost in damage if you let the dice explode infinitely, but honestly if you let the die explode 3 times (providing a potential 4x damage multiplier at the high end) you’re already averaging the 4.2 that is the asymptote. Since that’s the same as a brain hit (x4), you might as well cap it at 3 extra rolls per die. I think this might be fun at the table. The fixed (or partly variable; I’d suggested something like a varability of about 1/5 before) DR and PEN values would make some sense. If you made a PEN of 18 into (say) 14+1d, and/or DR the same kind of treatment (though it might depend on the armor), you could account for “no way in hell” penetration values as well as some degree of random for both injury and penetration. Exploding dice are icing, since it takes fixed penetration, and gives back randomness to it without changing the number or distribution of dice you roll. Seems like with a good code base, such as the free-form stuff you can write in MapTool, this would be invisible to the user, even including variable penetration, armor, and exploding dice. The big issue I have in play with Armor as Dice is I like to let the players roll their damage, and by letting them do that, I must give them intel on the armor rating in dice of the enemy. That’s less fun, because it kills tension. Fixed PEN values would pose the same problem, though. It would add a little high-end variability on the injury side, which is good. Ultimately, what we’re doing though is converting a fixed PEN-DR to injury. If you’re really doing it with a computer, the GM might as well double the penetrating energy (so in our example above, 24 PEN – 8 DR is 16 Penetrating Damage) and just roll 1d(2xPEN) or 1d(1.5xPEN) if you’re in (say) Roll20. That allows for grazes and lucky vitals hits, and the right kind of arbitrary where you can get a .50 that just wings you, or makes your head assplode. With rolling many dice, you get a mean effect that may or may not be swingy enough. But I will say this in passing; while armor as dice does have some nice effects, it also has some drawbacks, so YMMV. For every case where you say “My vest should stop a .45 ACP cold!” you can find a case where your angle to the shot wasn’t right and it misses the primary protection. That might be best modeled as a clean ‘no DR!’ case, though. In that sense, the Rules-as-Written are no loss. The player gets to roll his damage (and players like effect rolls), and the GM can keep DR and injury hidden, if she wants. Am I bound and determined to revisit and rewrite every GURPS rule? No. But in writing Technical Grappling, I became very taken with effect rolls, in the vein of hit points and control points. The general progression of a hit roll followed by an effect roll is familiar and favored by gamers. Personally, I like the differentiation between skill and effect. Where it comes to On Target, this gestated for a goodly long time. I think it originally came from a basic unease with the Precision Aiming rules from Tactical Shooting. A series of somewhat vague, somewhat concrete misgivings with the direction of the rules, the amount of time they take, the determinism of them. But I really did like the overall concept of rolling for extra aiming bonuses. My instinct, quickly suppressed as being not-fun, was to use three rolls, rather than two. An acquisition roll, in order to get the target basically in your sights. This should be basically a “no roll” situation for open sights, but might be much harder for finding a distant target through a scope. 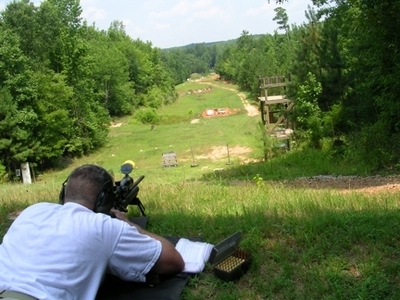 An aiming roll and effect roll, which is lining up the sights or scope precisely on the target, with the degree of precision achieved being determined by the Accuracy roll. Of course, you might do something like every -1 to skill is +10% to Acc, which at (say) a maximum -10 is doubling Accuracy. That’s not tragic, but seriously, 10% per -1 is just mean. You’d need to have a different penalty scale for each Acc result, and, wow, math-at-the-table-bad. Still, the overall desire to trade skill for damage is there, and some sort of leveled thing wouldn’t be tragic. Maybe some fixed thing, like -5 for +25% to Acc and -10 for +50% or something like that. Eventually, I went with ignoring it. Roll for accuracy, if so, get your bonus. Period, and done. The Acquisition roll makes sense from a real-world perspective, but adds an extra roll for the privilege of . . . aiming at all? No way. That would (and should!) make players revolt. No fun, so again no. One of the things that got tweaked a lot during playtesting was the concept of whether or not, and if so, how much of the various penalties you should take. The basic Aim rules are easy and range independent. Declare Aim, and whether your’e aiming at a huge target at close range or a small target at 1,000 yards, it’s equally easy to line up. The limited bonus even on high-Acc weapons mostly takes care of stuff. My testers and I ran through some scenarios, and settled on a middle ground. It should be harder to line up distant targets – and therefore take longer – it was felt. A no-penalty roll was too easy, and it was simply too difficult to line up long-range shots will full penalties. So an intermediate was selected. One of my favorite things that I did here was to broaden the scope of maneuvers, for both attacks and aiming, to the full scope of offensive maneuvers +Peter V. Dell’Orto and +Sean Punch introduced in GURPS Martial Arts. The concept of All-Out and Committed Aim and ranged attacks? Love it. With full symmetry. Wait . . . Wait! A couple new options that solve a few common quandaries in ranged fire were introduced, and again, proud of them. The availability of Step and Wait has been debated on the forums, and I personally allow it. The ability to cover an area, or a single line of fire, is a common thing in real life, and I wanted explicit mechanical coverage. This is the same thing as treating certain quick contests in grappling – such as my recommendation that damaging locks and whatnot be treated as an attack. This allows using the normal GURPS rules to do things in cinematic glory, because those rules are easily applied and well understood. One thing that did draw some questions in playtest and review was why I insisted on not invoking Multi-Strike for an Aim and Shoot action using Extra Attack. In my mind, this was more similar to a feint and attack rather than two full blows, for one. For another, honestly, the act of aiming is where most of the tough part is, and I didn’t see the sense in slapping on an extra point cost for squeezing a trigger. The most potentially unbalancing, but also the most fun, new cinematic rules are for Quick Aim. 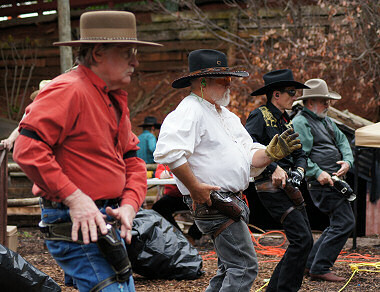 Being able to aim as a free action, akin to Fast-Draw, can be a big deal. But because the roll always suffers the Bulk penalty – which cannot be bought off – this should remain in the realm of super-gunslingers. If not, try doubling Bulk penalties instead. So Quick Aim with a handgun will be at -2 to -6 (mostly -4), a carbine or SMG is -6 to -8, most full rifles are -10 to -12. That will force people to use smaller, handier weapons to claim that bonus, which may well impact the choice of weapons in a very realistic way. But don’t just take my word for it. +Jake Bernstein took On Target (or an early version of it) for a test drive seven months ago. And +Christopher R. Rice also got into the game, and . . . well, listen to what he has to say. Douglas’ On Target, also (and originally) known as Alternate Aiming, has been in the cooker just over a year. I first got a gander at it in February 2014 when he posted it to the Pyramid Mentoring Group’s mailing list. I knew damn near instantly that this was something I wanted to see developed. After Doug got it into shape, I started using the rules in my campaign – and I have used them since. I know that Jake Bernstein put in a lot of hours too, but I think I was the only one using it in a real game until Doug used it for Alien Menace. My gaming group, the Headhunters, actually full-on revolted when I tried to not use it for a campaign setting. Since I run my group like a pirate democracy (co-GM is chosen by the players, who then elects the GM), I basically had to backpedal. I’m kind of glad I did though, because it let us find a few holes in Doug’s original design. I know I contributed to rules for Gunslinger, Telescopic Vision, Spells/Powers, and the random roll table for crits (I mean, you gotta have a random roll table, amirite?). Overall, I love the rules. It’s hard to do “simple and playable” with “complex and flavorful,” and I mean hard. But Doug pulled it off and I’m really proud of what the system finally became. One particularly memorable moment in one of my campaigns involved my best friend, C.. He was playing a man out of time in modern day, and just nailing his role. At the climax of the story arc, the PCs had to stop an evil witch (C.’s character’s wife) from summoning her demonic patron. Everything was going fine until several snipers began to fire on the PCs from the nearby lighthouse. In a moment of sheer badassitude, C. decides to kill two snipers with a single bowshot. Taking penalties for the Dual Weapon Attack (-4 for shooting two arrows at different targets), targeting the eye-chink (-10), 30 yards away (-7), and aiming “instantly” (-6). He proceeds to roll back-to-back triple 1s, rolls an 18 on the critical head chart, and maxes his damage. Basically he made Robin Hood look like a chump. I actually stopped the combat for a moment to make sure the math was right. It was. I instantly had to play Filter’s “Hey Man, Nice Shot.” It was just so awesome. I think that was what sealed the deal for my players with the aiming rules. Nothing is wrong with the Basic Set’s rules – but they like these much, much better. If you have a chance, you should grab a copy of Pyramid #3/77 – Combat – and not just because Yours Truly is also in the issue – but because Doug’s managed to create an “advanced” rules set with a (pardon the pun) simple “point and hit” interface. I’m sure once you try his alternate rules for Aim you’ll never use the Basic Set’s again. Yesterday’s post on Armor as Dice generated more commentary than any content-related post I’ve had in a while. So booyah, that’s good. Lively discussion and all that. However, +Jason Packer asked a question that echoed (and contrasted with) another poster’s comment about ensuring that you just subtract armor from damage and, if this is greater than zero, rolling the rest as injury. The answer doesn’t lie in the realm of complexity or avoidance of such. It lies in the realm of observed behavior of real-world stuff. Round Nose (FMJ RN) bullets with a specified mass of 8.0 g (124 gr) and a velocity of 373 m/s ± 9.1 m/s (1225 ft/s ± 30 ft/s) and with .40 S&W Full Metal Jacketed (FMJ) bullets with a specified mass of 11.7 g (180 gr) and a velocity of 352 m/s ± 9.1 m/s (1155 ft/s ± 30 ft/s). Type IIA armor that has been conditioned shall be tested with 9 mm FMJ RN bullets with a specified mass of 8.0 g (124 gr) and a velocity of 355 m/s ± 9.1 m/s (1165 ft/s ± 30 ft/s) and with .40 S&W FMJ bullets with a specified mass of 11.7 g (180 gr) and a velocity of 325 m/s ± 9.1 m/s (1065 ft/s ± 30 ft/s). OK, from a GURPS standpoint, we’re looking at 124gr 9mm ammo at 373m/s, and 180gr .40S&W at 352 m/s. If you use my bullet model, that’s 10.1 points of penetration for the .40S&W, or 9.1 points for the 9mm – surprisingly to me, the .40S&W is the greater threat. So based on these criteria, a threat level IIA vest should stop that average damage (that’s how GURPS DR is defined), so let’s call it DR 10. All of this is for a new vest, but the upshot of the “conditioned” vest standards is about a point less, or about DR 9. Note that threat standards have gone up over time. I believe a Level IIA vest used to be rated more along the lines of .22 LR and lower velocity .38 special, maybe .45ACP . . . but NIJ revised their standards in July 2008. The IIA used to be DR 8 or thereabouts. I’d have to go back on old Forum posts for that one, or just check GURPS Cops, by Lisa Steele. Now, a .45 ACP has but 450J or so, compared to the very hot 725J (hotter than a lot of standard 10mm Auto bullets!) contained in the .40S&W spec. 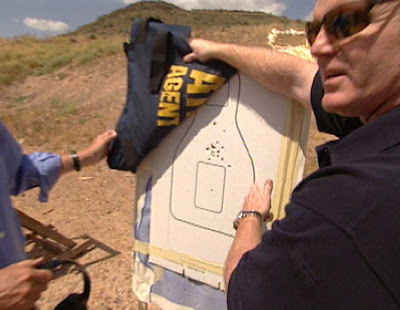 A Level IIA vest will stop a .45ACP pretty much always under the test conditions. But the variability in penetration if you roll damage vs DR 10 is 2-12, so there’s a small but real chance of a .45 ACP defeating this vest. If you take a more reasonable .40S&W at 320m/s (1050fps or just shy of 600J) for 9.1 points of damage, the vest should always defeat it, but 2d+2 vs DR 10 has a reasonable chance of overmatching the vest. A weapon down to 2d-1 is still a legit threat, and it really shouldn’t be. Thus, the “Armor as Dice” concept, which applies the average damage of a bullet, 2d for a .45 ACP, 2d+1 or 2d+2 pi+ for .40S&W depending on load, 2d+2 pi for 9mm NATO standard to the average DR (in dice) of the bullet. You have to overmatch the armor before a penetration occurs. Missing the vest and hitting the armor is usually handled by critical hits (one option is halving DR) or targeting chinks. In fact, considering critical hits, it might be a good idea to rewrite the table if using Armor as Dice – or at least re-interpret it such that for firearms, any “max damage” results have an armor-reducing effect instead. “Max Normal Damage” and “Double Damage” results should be rescoped for this case as “half DR.” “Triple Normal Damage” would be easy as “1/3 DR or Armor only provided one point of DR per die,” which are mildly equivalent. The overall point of armor as dice – originally – was to ensure that the variability of a normal 1d6 or 2d6 distribution didn’t overwhelm plausible verisimilitude by providing the propensity for a teeny bullet like a .380 ACP from overmatching armor or a vest that it would simply never do in real life. The .45ACP, which is a fine man-stopper but being huge and slow is a poor penetrator, is a more credible example of the type of round that is stopped fairly routinely by lower protective armor. The side effect of this, in play for me, was much simpler calculation of “threat/no threat” decisions in the black ops game I played a while back, where I could pretty much instantly determine how much injury a victim would take with very quick math. But the overall question, “why not roll both?” goes in the opposite direction of what expressing dice of DR is supposed to accomplish. Now, if you want more complexity, either because you do much of this stuff with a computer or you just groove on it, I’d probably look to one of the optional rules in Armor Revisited to fix this. 6d damage would be expressed as 18+1d instead of 6d. DR 18 might instead be something like 10+2d. You could roll both and see what goes through (8-1d injury). I’m not sure I’d do it that way without a computerized game aid, but it’s certainly doable. Armor as Dice – what and why? The term “Armor as Dice” was coined somewhere on the GURPS forums to describe a method of treating armor using (oddly enough) dice instead of points of DR. It was a bit of parallel evolution – while I wasn’t the only one to come up with the phrase, I was using it in games as early as October 2004. 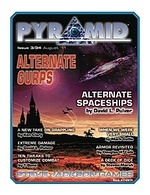 I expanded on the concept, which is pretty much what it says on the tin, in my short article “Armor Revisited,” from Pyramid #3/34: Alternate GURPS. The way I do this in my games featuring guns is that I convert armor to dice of resistance, at 3.5 points per die. Armor gets the benefit of the doubt (that is, a remainder of 1.5 becomes 2) but you have to earn each full die. Meaning that 12pts of damage becomes 3d+1.5 = 3d+2 protection, while 13pts id 3d+3, rather than 4d-1, because that extra die can be very important. You then just subract armor from firearm damage and roll the remainder. For hard armor, this works great. So a 5d bullet hits a 4d metal plate (that would have been DR 14, or about 5.1mm of RHA steel), and what punches through is 1d of wounding. To be very clear: you subtract armor dice from damage dice. You don’t roll until after you’ve done this, and that is an injury roll, which is then modified for bullet size, hit location wound modifiers, etc. For flexible ballistic armor that lacks stuff like shear-thickening fluids in them, the bullet tends to either go right through with hardly any slowdown, or get totally stopped. For this type of armor, a special rule: if the attack average damage is more than the armor DR – higher dice of damage than armor DR dice – you subtract one point of damage per die of armor. So a 5d bullet hits a 3d+2 (DR 12) flexible armor vest. 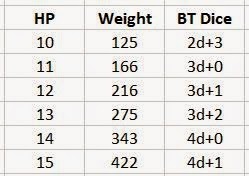 Damage is not 2d-2 like it would be for hard armor, but 5d-3. Ouch. This is the way kevlar works in reality, and if you look up the NIJ threat levels as presented in GURPS Cops, and convert them to dice, you match reality very well. This means if you overmatch a flexible vest by even just a little you will overwhelm it and do a lot ofdamage. If you have a 3d-1 bullet (average damage 9.5) vs a 2d+2 kevlar vest (average protection 9), it only gets 2pts of protection (2d is 2pts), and net damage is 3d-3. Ties go to the armor; or if you can handle a touch of complexity, roll 1d-4 whenever the dice of damage are equal, but the numbers aren’t. So 3d-1 bullet vs a 3d vest becomes (3d-1) – 3d = (1d-4) -1 = 1d-5; roll a 5 and it’s a zero damage breach of the armor; roll a 6 and it’s one point of penetration; roll 1-4 and the armor stops it. Great, so you should always do this? Probably not. While this works quite well and improves verisimilitude for bullets (and actually helps speed of play in most instances), for hand-to-hand combat in fantasy realms it doesn’t work so well as described. Firstly, the strength and power of a hand-delivered blow can be quite variable, while the energy delivered by a gunshot is usually within a few percent of the average for each time (at least out of the muzzle). Not only is the damage from a melee blow pretty variable, armor can be variably thick. Not only “can be,” but at least for late-stage plate, nearly always was. That could be leveraged in interesting ways (roll 2d+1 for damage, but armor is 3+1d6!) if you want to do such a thing, but now you’re getting into complexity for the sake of it. Also, While DR 7 –> 2d makes good sense, values from DR 1 (about 365 microns of RHA steel!) to DR 6 are probably best left as DR values rather than dice. Of course, the fact that every bullet leaves the muzzle with roughly the same energy (I’ve heard about 10-15% in energy, which is 5-7% in velocity, and probably even tighter for match-grade ammo), that doesn’t mean all strikes are created equal. A bullet can hit a thin part of the armor (penetrating more easily, effectively hitting a “chink”). This is best represented by a called shot (“I shoot his armpit!” or “I aim for the side panels of the vest”) where DR is halved at the usual huge penalty (something like -8) or a critical hit that has the same result. More likely is that the bullet has the right constant amount of energy, but hits at a bad angle. That will effectively lower penetration. And if you get variable penetration and variable thickness armor, well, you might as well roll damage anyway, right? Armor as Dice was created to reduce the penetration variability of weapons – usually guns – that should be 100% stopped by a given piece of armor, but punch through because of the potential 70% higher damage that can be rolled compared to average penetration. Since GURPS armor values are in fact set at average penetration (DR 70 = 2d = 1″ RHA steel), this provides too much oomph to projectiles. So if you’re going to do this, just subtract armor dice from damage dice, and roll the remainder as injury. Again, as in the article, it would be reasonable to make gunshots partly fixed and partly variable, to account for just such things. DR as either numbers or dice would work in that case, since you’re rolling anyway, but dice to dice or numbers to numbers make for faster comparisons. I periodically mention that I’m going to start a game here at some point, likely something like a GURPS: X-Com or Monster Hunters style game that will basically be Dungeon Fantasy but with guns. Or maybe swords and guns. Or sword guns. Yeah, I’ve got to get one of those. I would definitely be using the Armor as Dice rule for the guns. It really does make things easier for me to track. I would, however, also only use dice for DR7+, while DR1-6 would just be . . . DR 1-6. 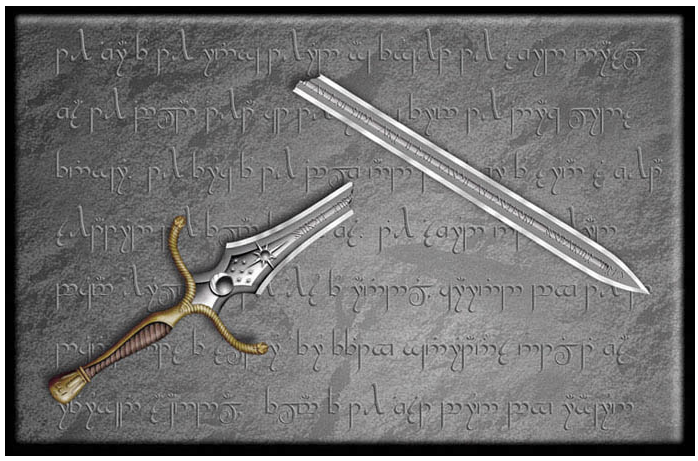 Hand-to-hand damage would always be rolled as well, providing no change for most melee combats (and by extension, most fantasy games, especially if rescaling damage to better accord with the firearms scale). I might do that too. Might not. Once you get into 300-400 points of pure awesome, realism goes out the window, and if you’ve got stones big enough to close to hand-to-hand distance with a sword, you deserve the damage boost.